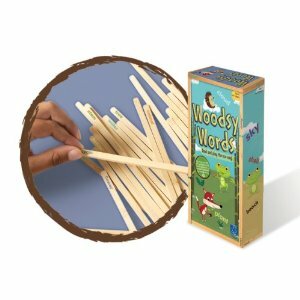 Woodsy Words is an eco-friendly take on the classic children’s game of [amazon_link id=”B000INOXM0″ target=”_blank” container=”” container_class=”” ]pick up sticks[/amazon_link]. Just like the original, you drop all of the sticks, then try to pick one up without moving the others. What makes this game unique is each stick is printed with an “earth-friendy word”. From “recycle” to “ocean”, Woodsy Words gives an added literacy twist to pick up sticks. Furthermore, each stick is made from bamboo and printed with vegetable ink. It’s Pick Up Sticks with a reading twist! Woodsy Words enhances reading skills with simple game play–simply hold all the sticks in one hand and let them fall onto a flat surface. Select one stick–if you can extract it without moving any of the others, read the word printed on it and select another stick. Continue play until you bump another stick or get stuck on a word. The player with the most sticks at the end of the game wins! Put them back and start again or try to use all your words in a sentence! Even for children who are struggling to read or are younger, they can practice spelling each word, and likewise older children can be challenged to spell the word of the other players without looking at their stick. It’s a pick up sticks environmental spelling bee! Would I buy this product? Yes. I think pick up sticks is a fun game. I remember it fondly from my childhood. I would even play it alone. The added literacy twist is a bonus, as well as the earth-friendly materials. I also think it is an affordable green toy at $12.99. I have never been a fan of scented markers, pens, pencils, or stickers. Sure they appealed to me when I was a child, but now that I am more conscious, I wonder what makes them keep smelling and smelling, and smelling. Smens Gourmet Scented Pens are a twist on the classic [amazon_link id=”B000N4CMQ8″ target=”_blank” container=”” container_class=”” ]scented markers[/amazon_link] of my youth. These ball point pens features scents you won’t find in children’s markers, such as mocha, aloha, and ninja berry. 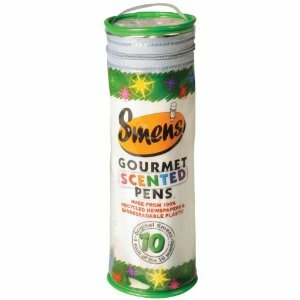 Smens;The latest release from the best-selling manufacturer of Smencils, Smens are gourmet scented pens made from recycled newspapers. Available scents include Red Licorice, Creamsicle, Aloha, Mystery Scent, Banana Fo Fana, Mocha, Passion Fruit, Ninja Berry, Pink Lemonade, and Black Licorice. Each Smen is individually wrapped in a stay-fresh biodegradable plastic tube and is guaranteed to keep its scent for two years. Each pen is made from “100% recycled newspapers & biodegradable plastic”. That part I commend, but these pens are over packaged! Even though the outer package and each pen package is made from biodegradable plastic, it’s a lot of packaging for ten pens! Would I buy this product? No. I don’t trust scented products; they certainly can’t be natural and last for two years. I don’t like all of the packaging, and $27.00 is a lot of money for ten pens! My children are unique. They are individuals. This was evident in their toilet learning. My daughter loved her [amazon_link id=”B000056J7L” target=”_blank” container=”” container_class=”” ]Baby Bjorn potty[/amazon_link], but my son would not sit on it at all. He wanted to go straight to the big potty. No messing around, and frankly, he knew an easier way. No transitions from that plastic potty chair to the big one. No confusion in public restrooms. Simple. <a href=”http://www.amazon.com/gp/product/B003TLV9QG/ref=as_li_ss_tl?ie=UTF8&tag=ecochildsplay-20&linkCode=as2&camp=1789&creative=390957&creativeASIN=B003TLV9QG”>Little Looster, Booster for the Loo</a> is a plastic stool that fits around the toilet. 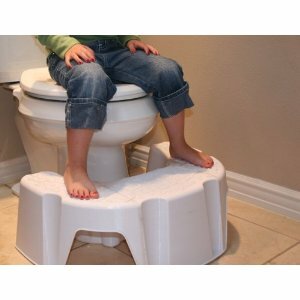 It makes it easy for a toddler to get onto the big potty, as well as keeps their legs from dangling. Parent Feedback says kids are potty training 2 months faster at minimum! Save hundreds on diapers and save the environment with less diapers in landfills! US Mom Invented and Made in Oregon! The Little Looster is a big piece of plastic! Granted it is plastic made in Oregon, not China, but still. As far as I can tell from the product and website, it is not made from recycled plastic. The above claim of saving the environment with less diapers in landfills to me is a stretch. No product can guarantee when your child will be potty-trained, and cloth diapers actually help speed up the process because kids can feel when they are wet or soiled. My son never fell into the big toilet. We never used a [amazon_link id=”B0009PAN7Q” target=”_blank” container=”” container_class=”” ]toddler toilet seat[/amazon_link]. We had/have a simple [amazon_link id=”B0039MIUXA” target=”_blank” container=”” container_class=”” ]wooden stool[/amazon_link]. The Little Looster is promoted as not needing to be moved every time your toddler uses the toilet, but our wooden stool was/is more versatile because it could/can be moved. It went to the sink for handwashing. It still is used to reach things on higher shelves by my youngest, who is six-years-old. Unfortunately, the Little Looster is not so multi-purposeful and would be discarded (hopefully passed on or recycled). Would I buy this product? No. In general, I avoid plastic, and as mentioned above, a wooden stool is more practical and versatile for the same cost. Even I use our wooden stool. Nothing is worse than a child up all night coughing, and it seems when the seasons change, new colds and flus come around our household. 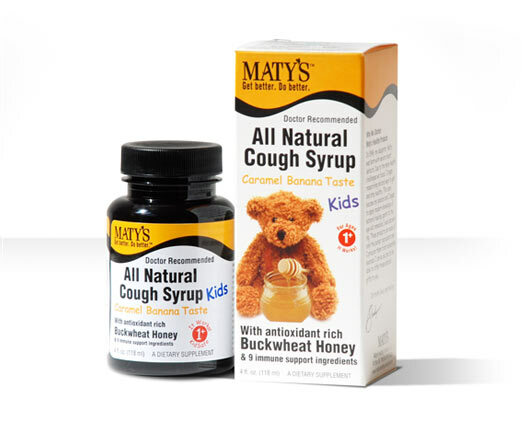 Maty’s Quiet Relief Cough Syrups are made in the USA and full of quality food-based products to make your child feel better. Like most of the products we review, Maty’s was started by a mom, a mom I feel connected too, as we both have children born with congenital heart defects. In 1996, my daughter Maty was born with severe heart defects. And to make matters worse, she was born without a spleen. It was a challenging time for our family. By age five she underwent three complex surgeries to repair her heart. Although her heart was mended, she was left with difficult medical issues and a weakened immune system. Her condition made her vulnerable. Desperate to help my little girl, I devoted my time to finding natural remedies that would help her get and stay healthy. Along the way, I uncovered many traditional natural remedies that were no longer widely used. I began to apply modern knowledge of nature’s healing agents to the age old remedies I was discovering. They became very popular with family and friends. Since these products contain honey, they are not recommended for children under one. Would I buy these products? Yes. I feel we are kindred moms because of our special heart babies. Furthermore, Maty’s supports Vitamin Angels. Bento boxes are all the rage now when packing home lunches. My own long term experience with the [amazon_link id=”B002KQZF3O” target=”_blank” container=”” container_class=”” ]Laptop Lunch[/amazon_link] was frustrating as it did not hold up over time. The plastic warped, and the box would no longer stay closed. 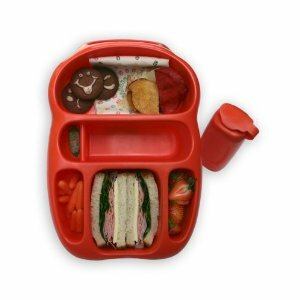 The Goodbyn Bynto Lunchbox is another dishwasher safe, BPA/phthalate-free, recyclable plastic bento box. It is made in the USA. Goodbyn, a better lunchbox reinvented for kids, parents, and our planet. BPA and Phthalate-Free and pack like you mean it. It stinks when your sandwich tastes like a banana or when your chicken korma tastes like your sweet rice roll. Goodbyn keeps tastes (and moisture) separate. Lunch tastes like it’s supposed to. Stick it. Love it. Raise your hand if you don’t like stickers. Who doesn’t? Each Goodbyn lunchbox comes with three sheets of hundreds of stickers: alphabets, body parts, allergy labels, you name it, you stick it. When things fit seamlessly into your life it’s a breath of fresh air, right? Goodbyn has a carrying handle, can easily be slipped into a backpack, or fit into a cubby hole at school. Feed, rinse, repeat. Grime isn’t fun, especially when you put your lunch in it. Our priority was to make Goodbyn dishwasher-safe, so we can keep our kid’s lunches clean – inside and out. Go on and on and on. Reincarnation is one of our favorite topics, especially when we’re talking about lunchboxes. One material for one reason: it can be recycled and reborn as something else. Would I buy this product? No. The plastic seems even more flimsy than the Laptop Lunch, and I just don’t trust plastic. Not too long ago, NPR reported that even BPA-free plastic leaches harmful chemicals into food and drink. I don’t trust plastic around my children’s food. The best bento box I have found is the stainless steel one by [amazon_link id=”B004KT23UC” target=”_blank” container=”” container_class=”” ]Planet Box[/amazon_link]. It may cost twice as much, but it will outlast the plastic bentos! « The Black Barbie Doll: Multiculturalism or Token Gesture?